An in-depth exploration of a unique archive of Middle Eastern topographical photographs dating from the early-20th century. Professor Sir Keppel Archibald Cameron Creswell (1879 – 1974), a pioneer of medieval Islamic architectural scholarship, travelled extensively in the Middle East, photographing sites along the way and leaving an extremely important photographic archive which is now preserved in a number of international collections. 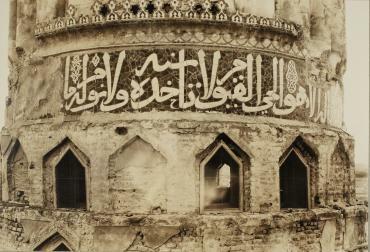 Noting his expertise in the subject of Islamic art and architecture, as well as his unique opportunities to take such photographs, in the 1920’s the V&A became the first public collection to acquire Creswell’s work. The V&A now holds more than three thousand of his photographic prints, the majority of which depict Cairo, but also other cities across the Middle East and North Africa. As part of the V&A’s commitment to digitising and thus improving access to its collection, this archive is now being analysed and systematically catalogued by researcher Omniya Abdel Barr, with funding from the Barakat Trust. During this talk, she will discuss her efforts to investigate Creswell’s photographs as well as the stories they reveal; adding geospatial data to map these historic sites and including Arabic script which will allow this important collection to be more accessible to our audiences. The project will also support the identification of valuable architectural elements which are now lost, destroyed or stolen from Islamic monuments, permanently documenting the fading traces of these important cultural sites. Omniya Abdel Barr is an architect specialized in conservation of historic towns and buildings. She has taken part in international projects related to urban conservation, monument restoration and documentation, as well as cultural heritage promotion. She is on the advisory board of the Egyptian Heritage Rescue Foundation, and holds a PhD on Mamluk architectural history.